Yeah, you read that right. Damn Magic 8-ball sold us a bill of goods. We were planning on seeing good ol' Martin Jol moving to take the reins at Fulham and by default, we'd see Sven staying with the Ivory Coast and/or Bob Bradley staying with the USMNT. Well, that's all shot to hell. Jol had an "emergency" meeting with Ajax officials in which he aired his grievances about not having any money to pick up proper players. Apparently, after having only signed a contract with Ajax last year, he was under the assumption they wouldn't sell all his players and actually try to win something (other than a domestic cup that is). Boy, was he wrong. Rumors are still rife that he'll lose Suarez (although at around £20mil, that's no chump change) and after recent articles in the NY Times that Ajax was just a "feeder" club in that it scouted, developed and then sold players for a profit, how were we to think otherwise? Well, good ol' Jolly put his foot down with a proverbial "I'm out." Fulham brass were happy to hear that all they had to do was agree compensation and they'd have their coach. Ajax refused, and there you have the stalemate. 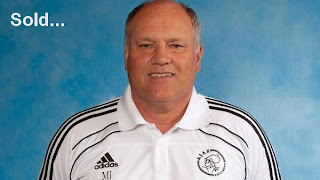 Jol's contract doesn't end till next year, and at that point, he's either re-upping or who knows... I hear Bayern will be looking for a new coach in the next year or two. Personally, I say take Bradley. That'll do wonders for US coaching rep in general. And, more importantly it'll allow us to pick up a new coach. The downside you ask? Well, that just further justifies the USSF's assumption that USMNT can be developed solely through MLS experience. Kind of a Catch-22 if you ask me. Well, let's hope Fulamerica, I mean Fulham FC get's on the horse and settles their coaching vacancy quickly, because nothing a player loves more than to play well all preseason, have a 1st team spot then have a new coach step in and relegate them to the bench.